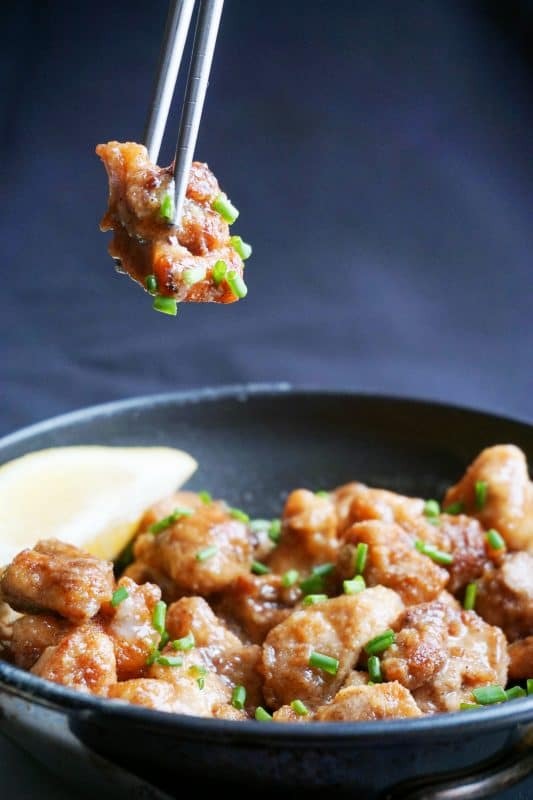 We're back at it with keto versions of our favorite Asian recipes, and this time we have our Easy Lemon Chicken for you! From breading the chicken, to making the lemon sauce coating, you'll find this dish extremely easy to replicate in no time at all. It's great for family dinner any night of the week, and classy enough to impressive friends at your next dinner party. No one will even know it's low carb, sugar-free and keto-friendly. 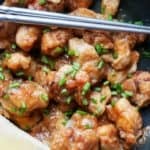 I'm always in the market for Asian recipes to keto-fy and I had never had lemon chicken until this recipe. We've replicated Orange Chicken but I was up for something new. As soon as I had made the dish, even before trying it, I knew I had made the right choice. Matt agreed. We took pictures, snaps, Instagram story pictures, and dug in. It hit the sweet, lemony, spot I had been needing to fill with something. During the breading process, I was contemplating doing a double coating, but I'm glad I didn't. I think it would have weighed down the chicken instead of producing this light, zesty recipe. For the breading, we did a light coating of coconut flour. No need for an egg wash or to add pork rinds or Parmesan cheese to the coconut flour. A simple, light layer of coconut flour creates the perfect fried, yet moist, chicken for this dish. In my opinion, it even trumps almond flour. The taste of the coconut flour doesn't come through too strong and it easily absorbs any sauce or flavoring you cover it in, which is essential for this recipe. Usually a recipe like this would be served alongside some rice to soak up the lemon sauce, but we have something even better, our Cauliflower Fried Rice. It is the perfect bed for this chicken, replacing all your favorite take-out restaurants. 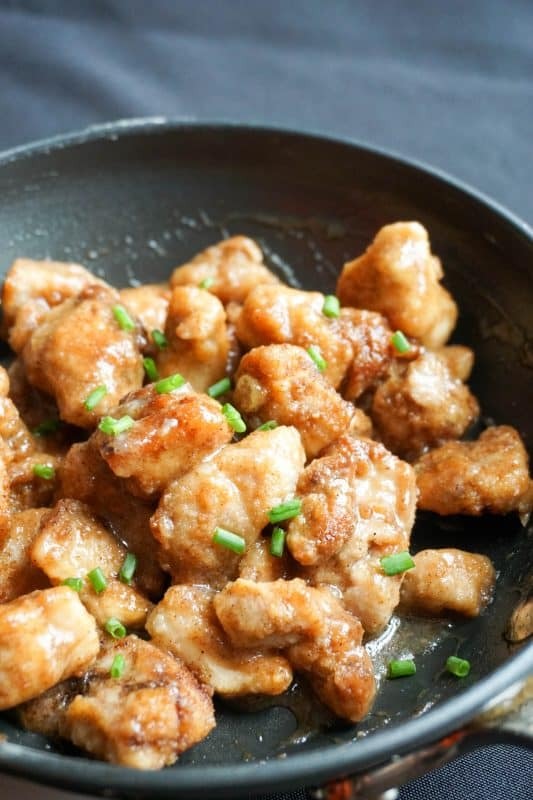 You could even do a family style Asian food night and cook up a big portion of our Easy Cashew Chicken for some variety! To make our Easy Lemon Chicken, you only need a few essential ingredients, so why not make it for dinner tonight? 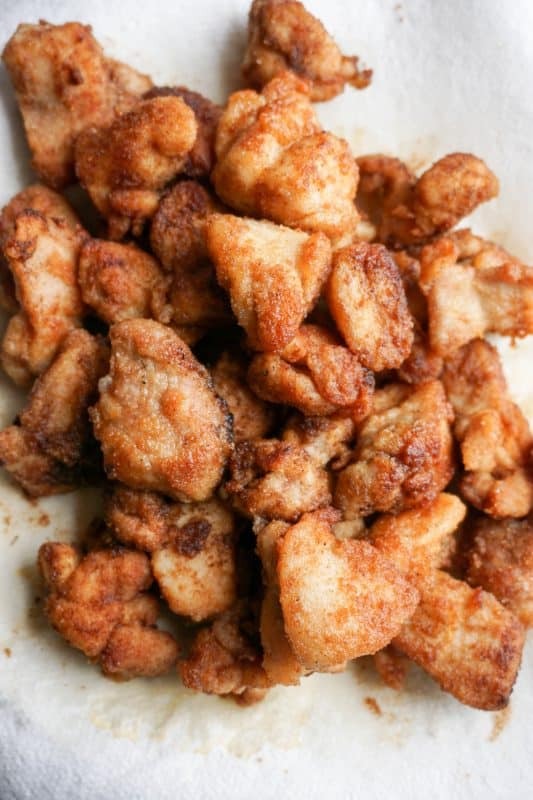 Recipe can be quickly added to MyFitnessPal - Search "KetoConnect - Easy Lemon Chicken"
Cut you thighs into bite sized chunks and set aside. Add coconut flour to a bowl and in small batches add the chopped chicken pieces into the flour fully coating them. Add coconut oil to medium-high heat pan. Once it is hot add the chicken pieces in batches until all are fully cooked through. Add lemon zest to a pan and turn it onto high heat. Add broth and swerve to a high heat sauce pan and combine until swerve is fully dissolved (erythritol may not full dissolve). Add the lemon juice and xanthan gum and bring to a boil. Reduce to a simmer and allow to reduce until desired thickness. Once thickened to liking, add chicken into sauce and coat. Serve warm with cauliflower rice and enjoy!